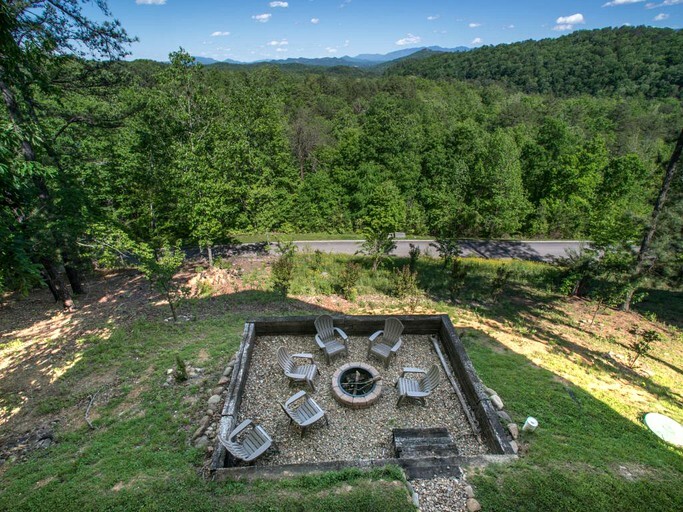 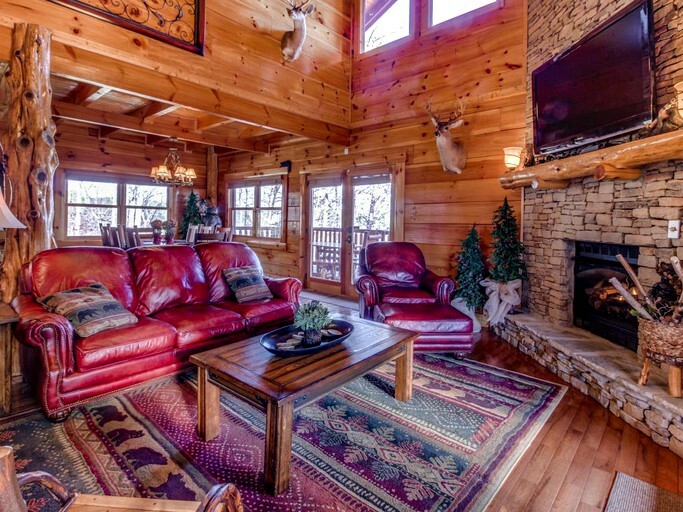 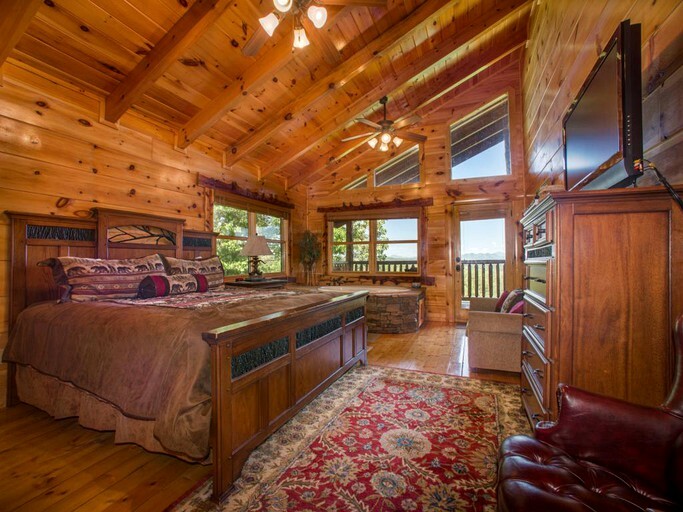 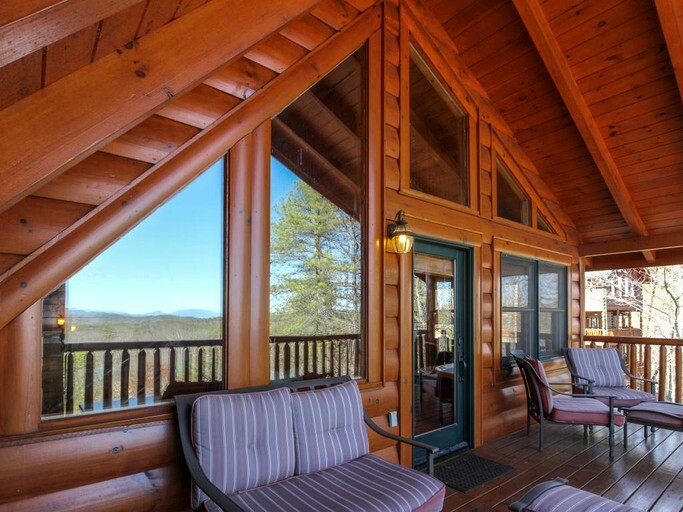 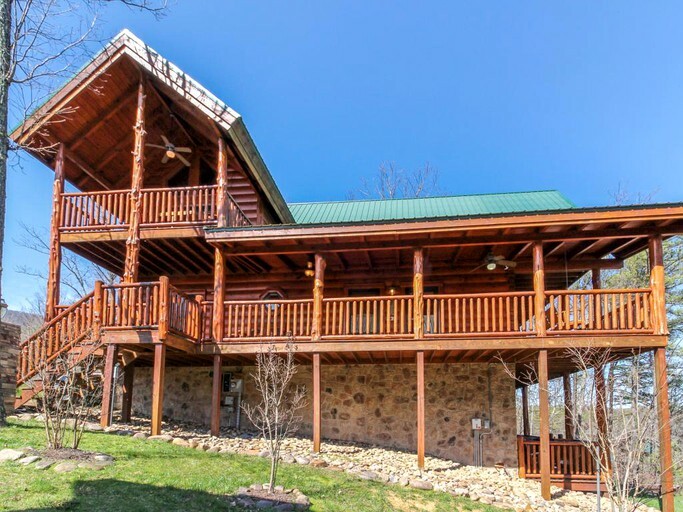 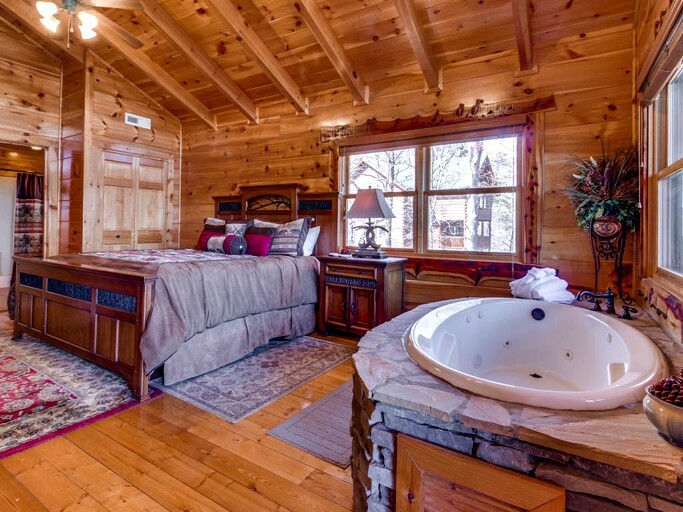 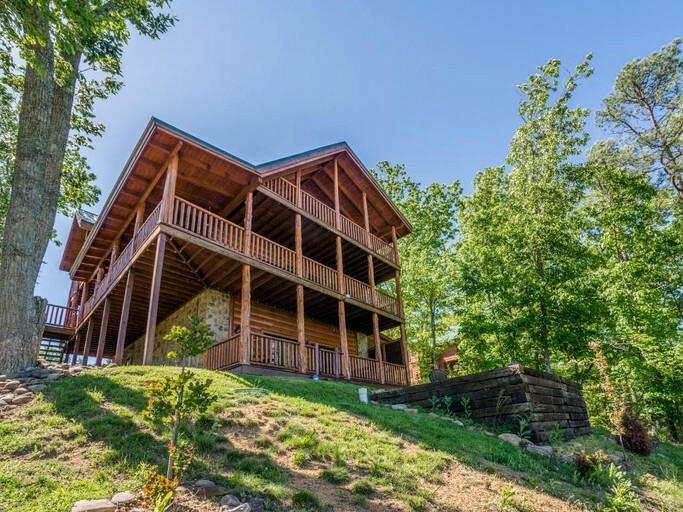 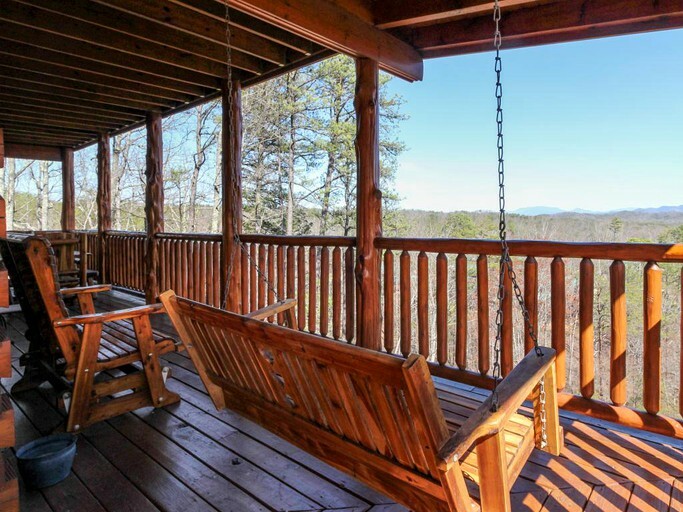 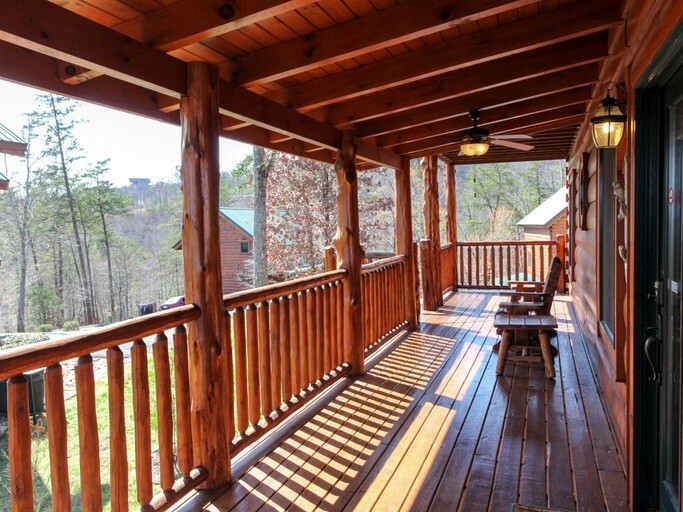 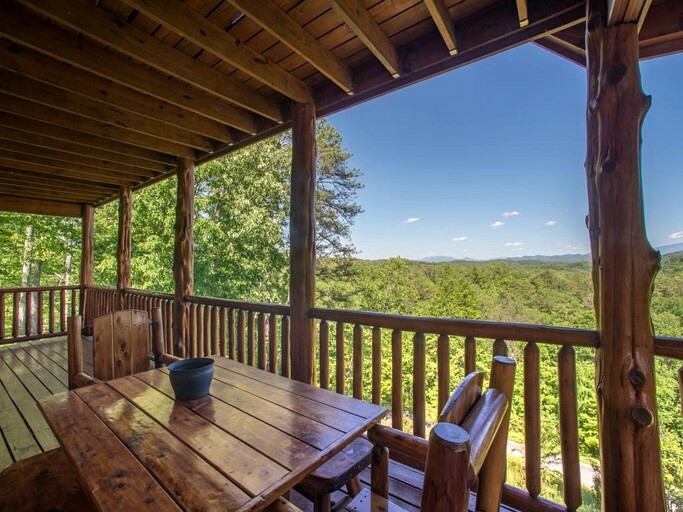 Winter birds will adore this 3,600-square-foot luxury accommodation near the Gatlinburg ski slopes in Tennessee. 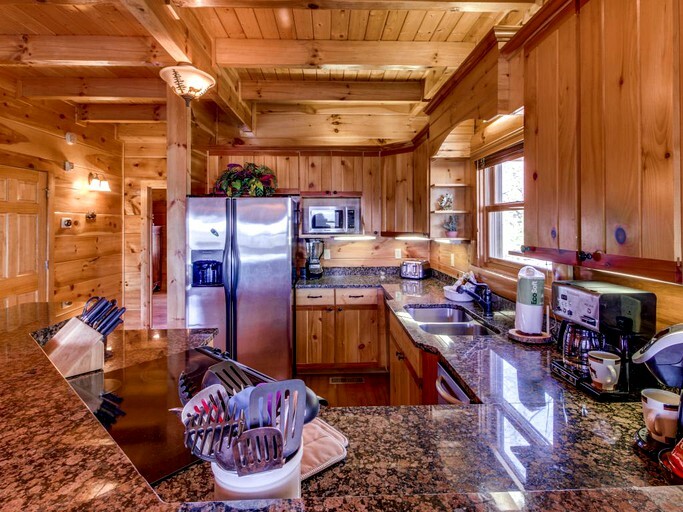 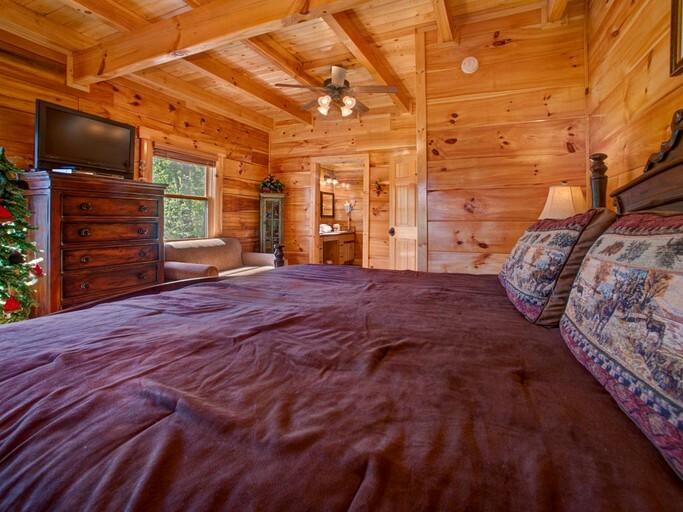 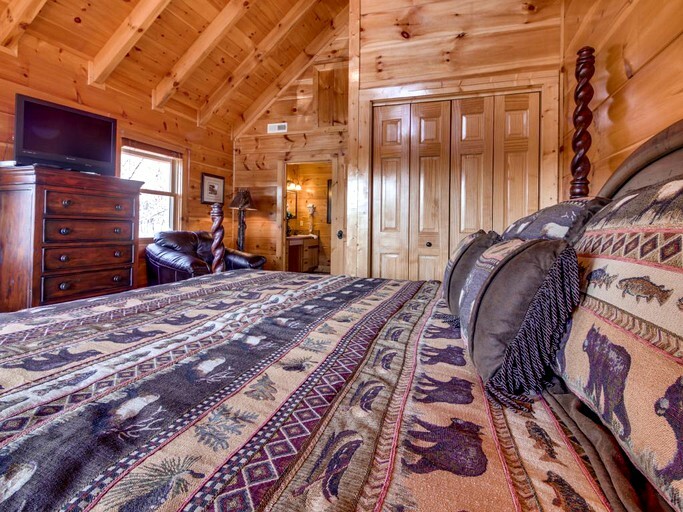 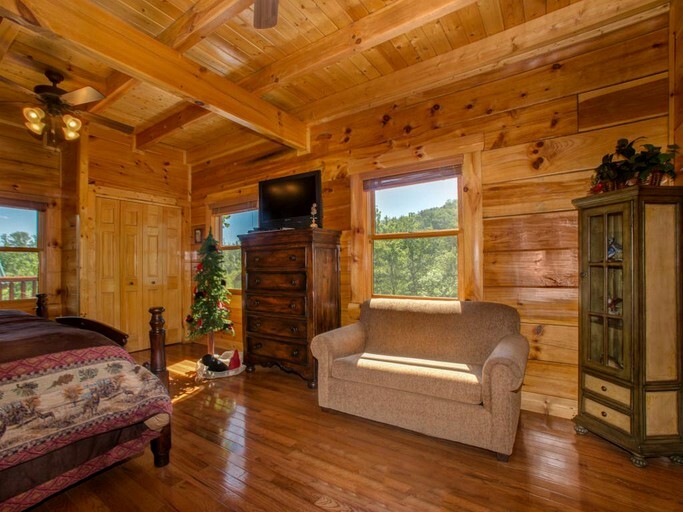 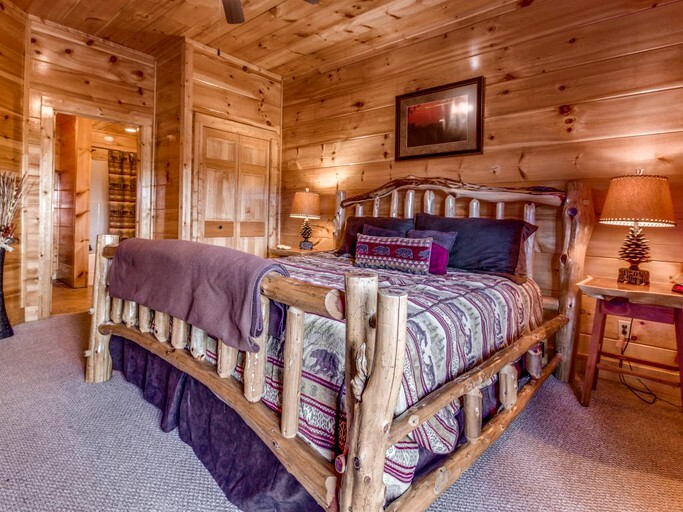 This rustic four-bedroom cabin comfortably sleeps up to 14 guests. 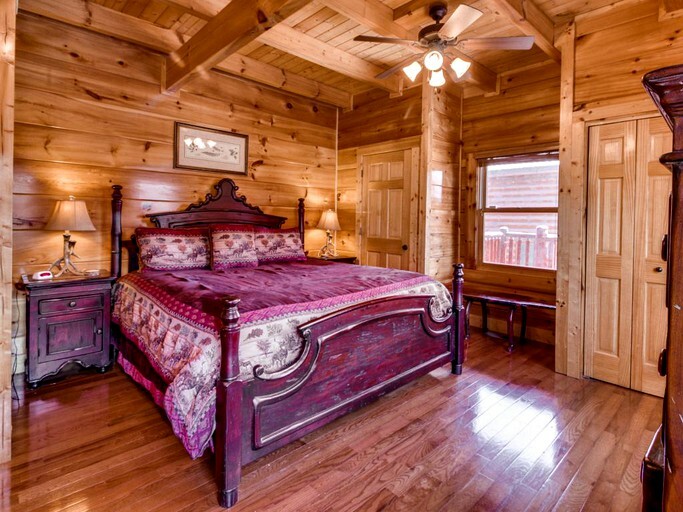 Each bedroom features a glorious king-size bed with an intricate wooden frame, an en-suite bathroom, and access to the deck and the outdoor hot tub. 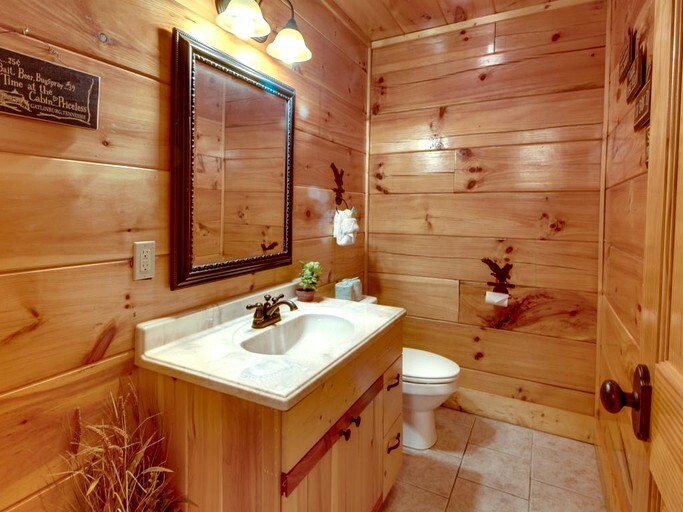 There is a Jacuzzi tub in one of the bathrooms for some extra spa treatment. 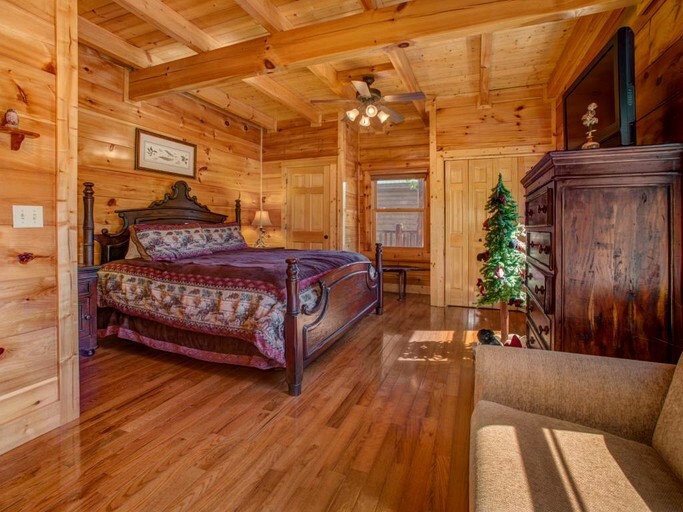 In addition to the bedrooms, there is also a queen-size sofa bed and four twin sofa beds for extra sleeping accommodations. 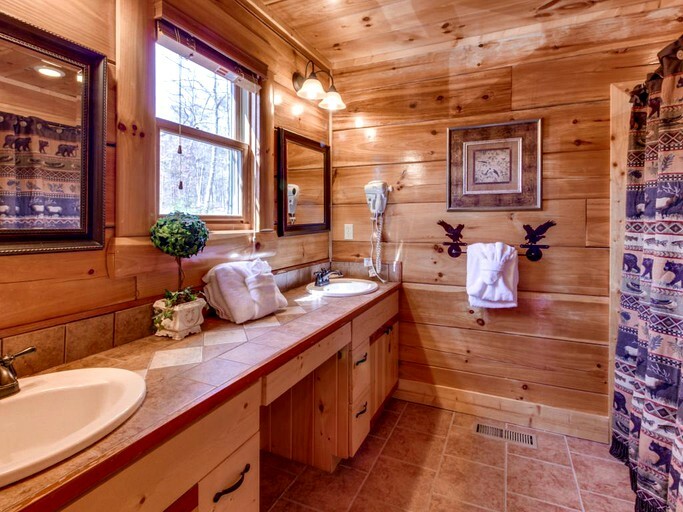 There is a half bathroom on the main level for convenience. 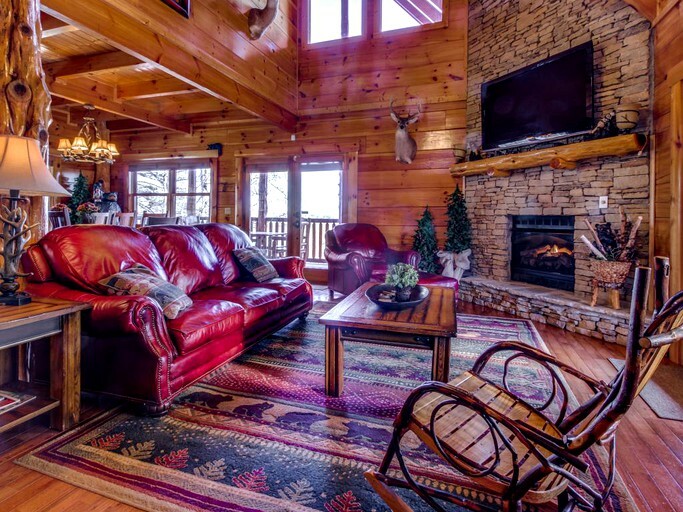 The stunning living room's focal point is the gorgeous stonework of the hearth gas fireplace and the 50-inch flat-screen TV. 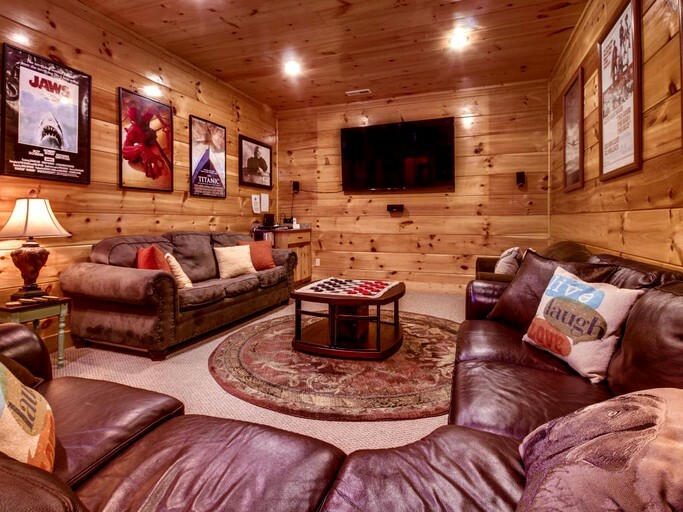 If guests really want the royal treatment, they can head to the private home theater to watch a Blu-ray or a DVD on the 75-inch screen, also equipped with Netflix. 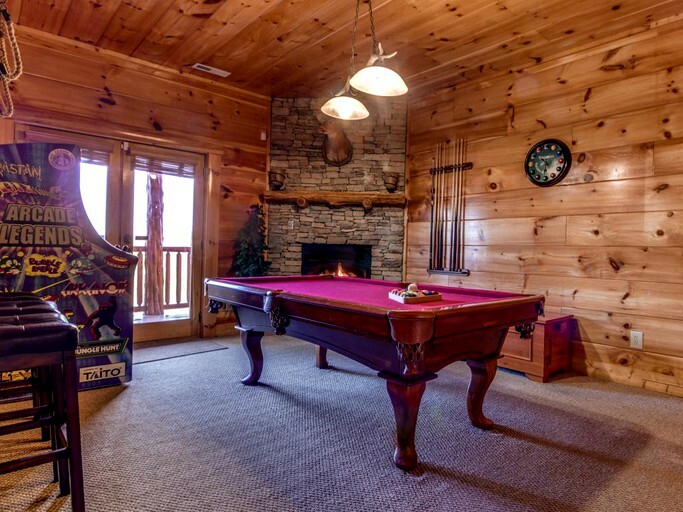 Hours of entertainment can be shared in the game room, which has a pool table and arcade games with a second cozy fireplace to keep guests nice and warm. 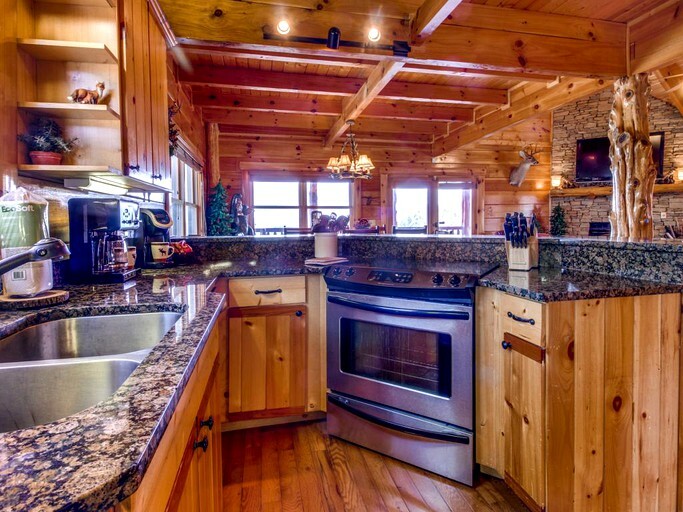 The fully-equipped kitchen is perfect for large groups and has all the modern conveniences to make cooking a breeze. 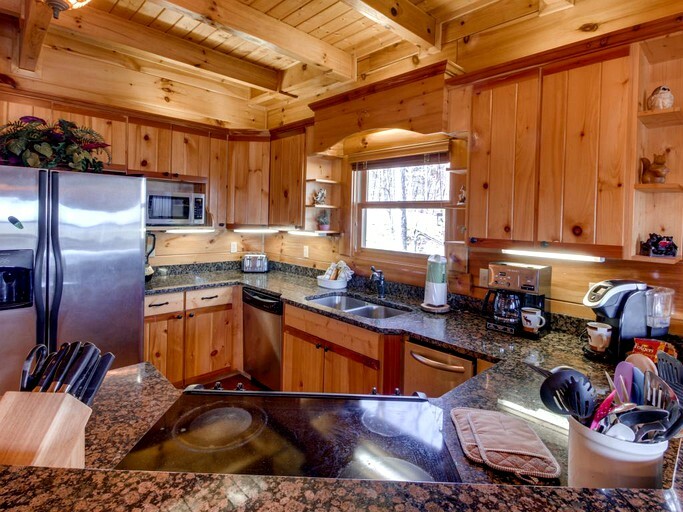 Stainless steel appliances and granite counter tops combine with the wooden cabinets to create a very modern cabin-in-the-woods vibe. 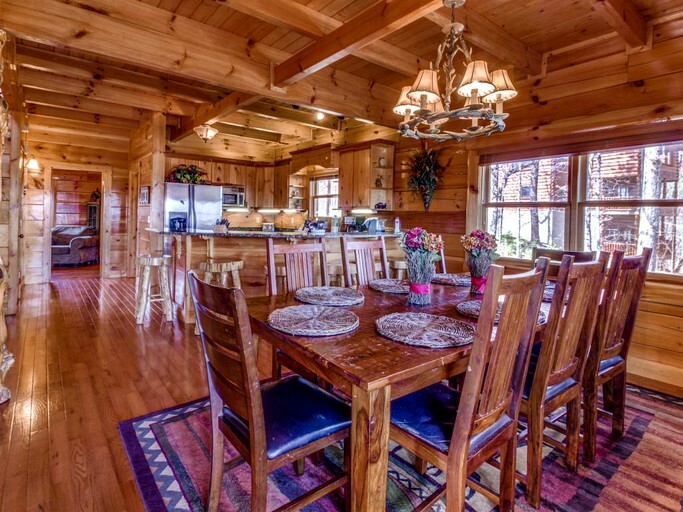 Guests can enjoy a meal together at the large dining table. 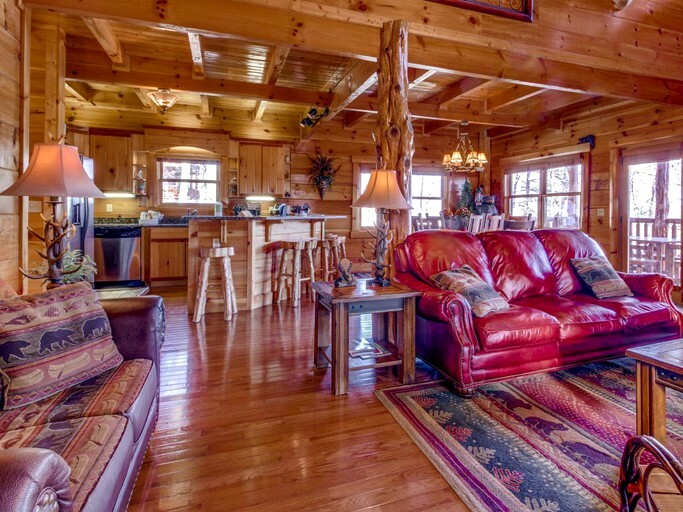 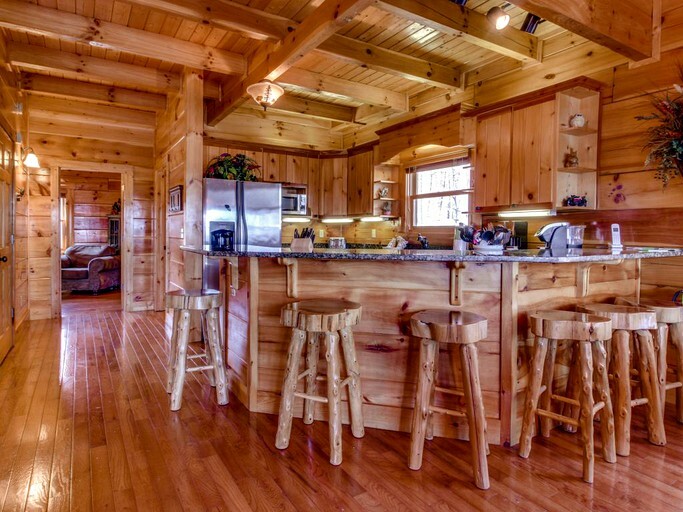 The cabin features Wi-Fi and cable TV. 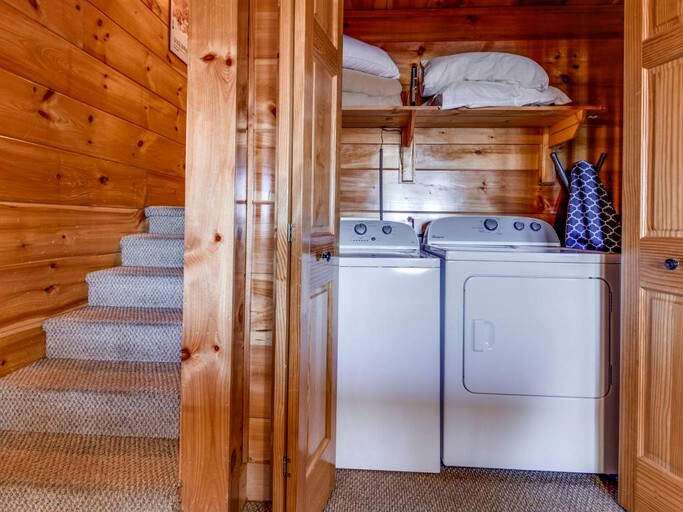 There is also a washer and a dryer, so guests can pack light. 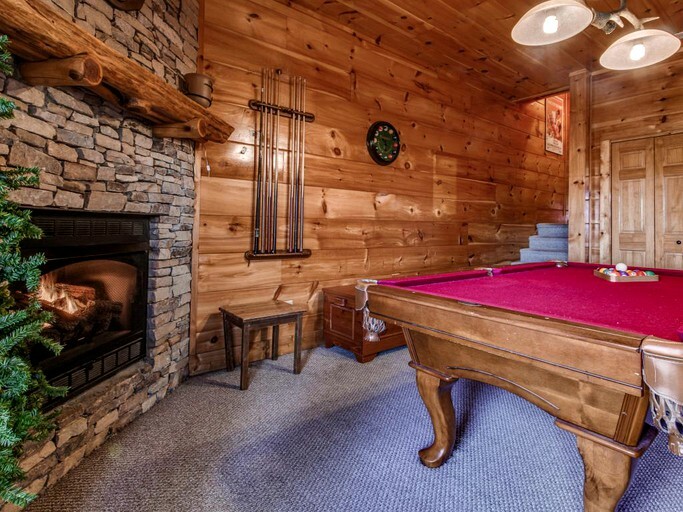 There is both an indoor gas fireplace and an outdoor fire pit. 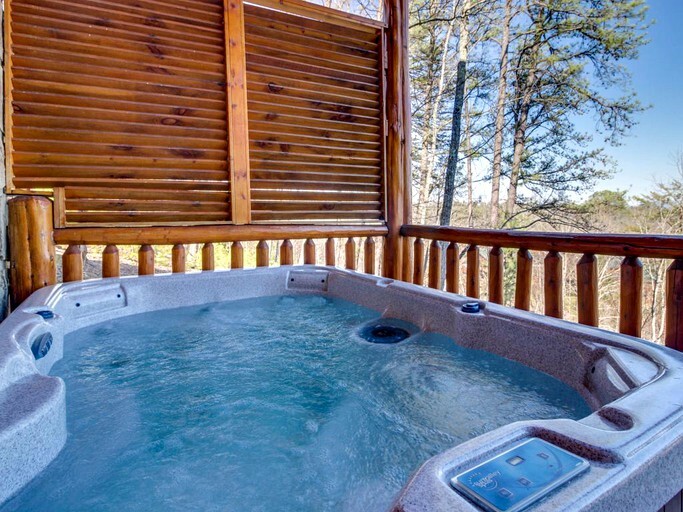 Guests have plenty of options between the indoor Jacuzzi, the private outdoor hot tub, and the seasonal shared swimming pool at the resort. 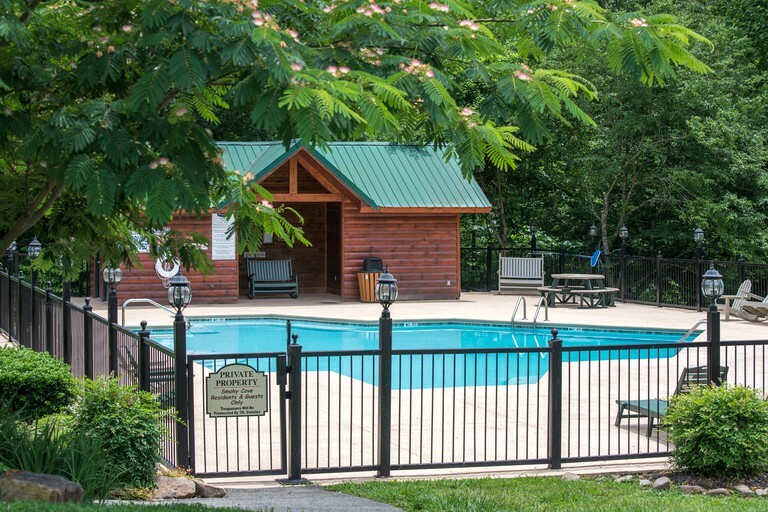 Also at the resort, guests have access to the picnic pavilion and a horseshoe pit. 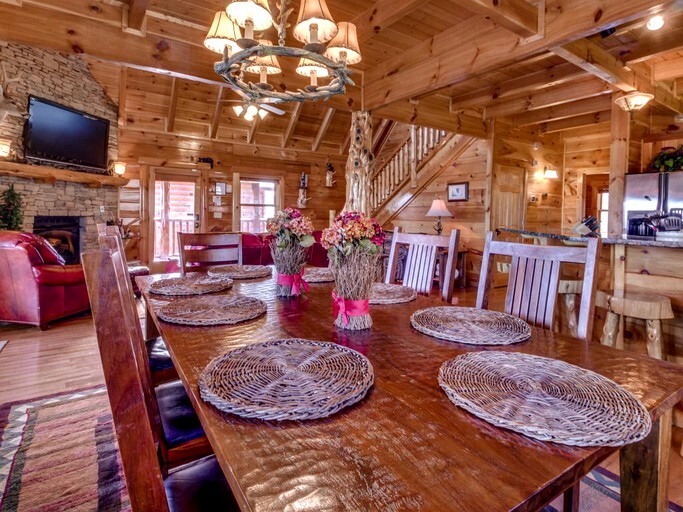 In the winter season, guests can head to Ober Gatlinburg to take advantage of the ski slopes. 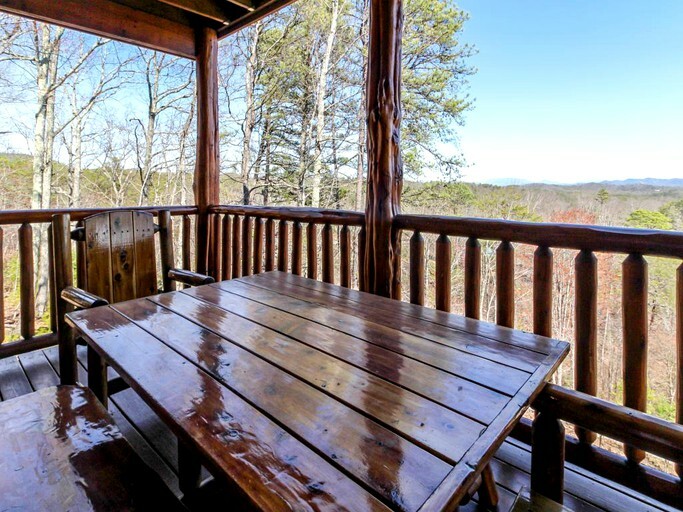 The area is ripe with outdoor activities, including hiking and horseback riding on the local trails. 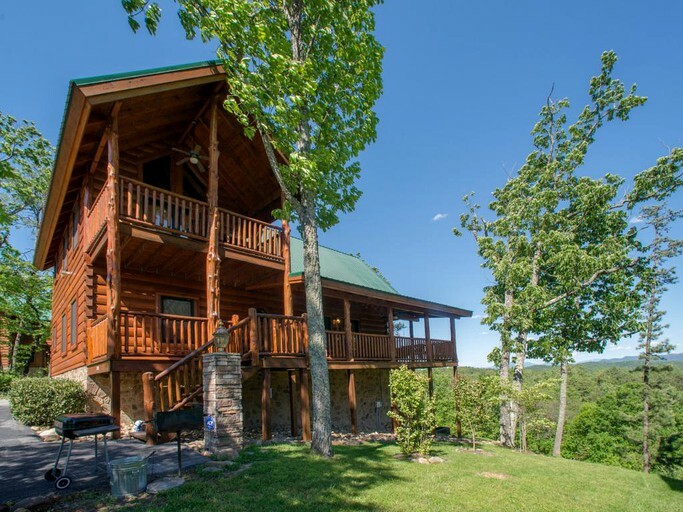 Guests can also visit nearby caves, play a few rounds of golf, or go zip-lining through the trees. 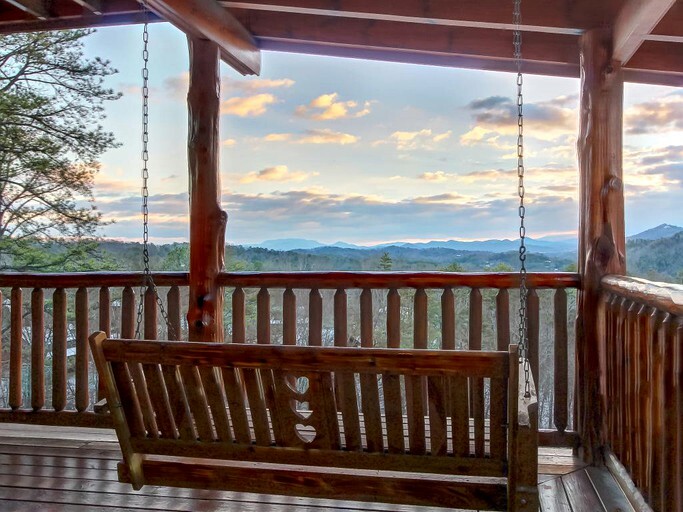 A quick trip into Pigeon Forge offers plenty of dining and shopping options, as well as a trip to Dollywood for amusement rides and live music. 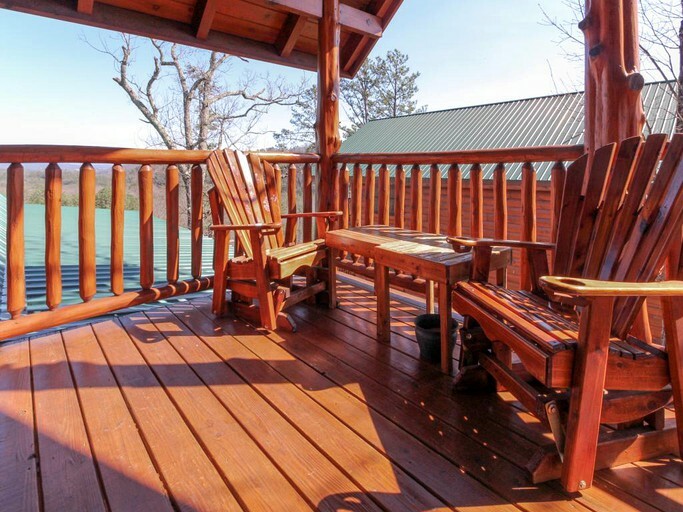 No matter the season, guests are sure to find plenty to do at this marvelous site.